Made with whole cuts of fresh beef and nutritious tripe plus fresh vegetable and wholegrain rice. 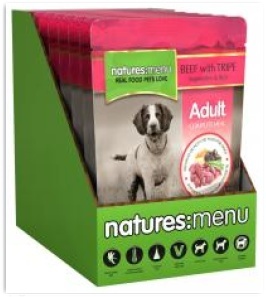 Natures Menu is made with 60% real meat (no meat derivatives or by products). Beef (min 40%); Broth (28%); Tripe (min 20%); Brown Rice (min 2%); Peas (min 4%); Carrots (min 4%); Minerals. Protein 9%; Crude Oils & Fats 4%; Crude Ash 3%; Crude Fibres 0.5%; Moisture 79%; Vitamin A 1.250iu/kg.